To Evanger on the "Ships starting with E" page. Manager: Westfal Larsen & Co. A/S Bergen. Tonnage: 3869 gt, 7280 tdwt. Dimensions: 365' x 52.3' x 26.2'. Delivered in July-1920 from Irvine's Shipbuilding & Dry Docks Co. Ltd., West Hartlepool as Evanger to Westfal-Larsen & Co. A/S, Bergen. Guestbook message - From the son of Haakon Werner Hofsten, who sailed on Evanger, as well as Mosfruit, Somerville, Gausdal, Belinda and Temeraire. Possibly sailed in OA 163GF. Aug. 29 Liverpool   OB 205 For Norfolk, VA.
March 16 Liverpool   OB 298 Dispersed March 20. Febr. 19 Liverpool   ON 68 For Halifax. May 13 Belfast Lough Cape Cod Canal May 27 ON 94 For N.Y.C. June 24 Boston Halifax June 26 BX 26 For Sydney C.B. Aug. 1 Liverpool   ON 118 For N.Y.C. Nov. 12 New York City Gitmo Nov. 19 NG 321 For Trinidad. (left Mobile again March 17). March 19 S W Passage Key West March 22 HK 158 S W passage to Key West. May 22 S W Passage Key West May 25 HK 184 S W passage to Key West. Aug. 31 Liverpool   ONS 17 For N.Y.C. Joined XB 74 Sept. 16. Dec. 1 Oban   ONS 24 For N.Y.C. Joined XB 88 Dec. 18. Febr. 27 Liverpool   ONS 30 Joined XB 100 March 13. Sept. 1 Belfast Lough New York City Sept. 19 ON 251 Convoy will be added. Sept. 27 New York City Boston  Independent Page 4 gives arrival Sept. 28. Nov. 13 Belfast Lough Halifax Dec. 3 ONS 36 Convoy will be added. Dec. 17 Halifax Liverpool Bar LV Dec. 31 SC 163 1155 Mails. 1945 Jan. 29 Liverpool St. John's, N.F. Febr. 18 ONS 41 For Halifax. March 27 Halifax Liverpool Apr. 10 SC 171 Convoy will be added. For information on voyages made in between those discussed here, please go to the archive documents and/or Hague's Voyage Record above. Follow the convoy links provided for more details, several Norwegian ships took part. Page 1 of the archive documents indicates that Evanger was en route to Norway when Norway was invaded by the Germans on Apr. 9-1940, but was diverted to Antwerp and French ports. She later arrived Antwerp on May 8, and was still there on May 10 when the air attacks on the city started. (The Norwegian D/S Madrono was also there). That same evening the British destroyer HMS Brilliant (Lt. Cdr. F.C. Brodrick) arrived to organize the departure of the 26 merchant ships in the harbour. They all got out on the 12th (archive doc gives departure May 13) followed by 50 tugs, while being attacked 3 times by German aircraft. Evanger arrived Boulogne on May 14. In June that year, she made a voyage to New York; A. Hague suggests she may have started out from the U.K. in Convoy OA 163GF, but this does not quite match up with the details found on Page 1 - ref. link provided within the Voyage Record above. In July, she can be found in the Halifax-U.K. Convoy HX 57, bound for Manchester with general cargo, according to the original Advance Sailing Telegram. She arrived Manchester on July 27, remaining there for a month, and is subsequently listed, with destination Norfolk, VA, in Convoy OB 205, leaving Liverpool on Aug. 29, dispersed the next day, Evanger arriving Hampton Roads independently on Sept. 16. The Norwegian Bestum, Olaf Fostenes (both for Clyde only), Solhavn and Thorøy are also listed in OB 205. Evanger headed back to the U.K. in Convoy HX 81 from Halifax on Oct. 16, arriving Liverpool Nov. 2. The following month, she shows up, with destination Philadelphia, in Convoy OB 262, leaving Liverpool on Dec. 20, dispersed on the 23rd. Bur, Grena and Nea are also listed - see the external links within the table above for more on the OB convoys mentioned here. Evanger arrived Philadelphia independently, via Halifax, on Jan. 10-1941. At the end of Jan.-1941, we find her in Convoy HX 106 from Halifax (Commmodore in Topdalsfjord). It looks like she was bound for Manchester again, arriving there on Febr. 20 (Page 1). With Belinda, Havsten, Malmanger and Strinda, she later joined Convoy OB 298, departing Liverpool on March 16, dispersed on the 20th, Evanger arriving Halifax on Apr. 1, proceeding to New York a few days later. She subsequently remained there for quite a long time, before returning to Halifax on May 18 in order to join Convoy HX 129 on May 27, bound for Newport with general cargo - see also the Cruising order/Commodore's notes. Evanger arrived Barry Roads on June 13, Newport the next day. At the beginning of July, she's said to have joined Convoy OB 341A, which originated in Liverpool on July 2 and arrived Halifax on July 18. It'll be noticed, when following the link to this convoy in the Voyage Record above, that escorts only are named, while Evanger has ended up, together with Brisk, Fana, Leikanger, Novasli, Nueva Granada, Nyholt, Polartank, Ringstad, Sommerstad, Thorøy, Thorshavn, Thorsholm and Vigsnes, in OB 341, which had started out in Liverpool on June 30 and dispersed on July 6. I suspect that some of the ships named in OB 341, in fact, belong in OB 341A(?). Note also that a total of 82 ships are listed in OB 341, which should have only 35. According to Page 2, Evanger sailed from Milford Haven on July 1 and arrived Halifax on the 18th. The following month we find her in Convoy HX 144 from Halifax, along with Polartank, Orwell, Hallanger, Eidanger, Havprins, Grena, Suderøy, Norse King, Vinland, Ranja and Sommerstad. Evanger subsequently joined the westbound North Atlantic Convoy ON 16, but A. Hague says she was detached and sent to Convoy ON 17 instead. From the archive document referred to above, we learn that she arrived Halifax on Oct. 5, proceeding to New York the next day. With general cargo for Liverpool, she headed back in the other direction with the slow Convoy SC 65 from Halifax on Jan. 17-1942, having been cancelled from the previous convoy, SC 64. She arrived Liverpool on Febr. 2, returning to Halifax with the westbound Convoy ON 68*, which left Liverpool on Febr. 19 and dispersed March 9 and also had Aun, Carrier, Danio, Ingertre, Rio Verde and Tyr (sunk - follow link for details) in its ranks. Evanger served as Commodore Vessel on that occasion and arrived Halifax on March 10. Having made a voyage to New York, she returned to Halifax in order to join Convoy SC 77 back to the U.K. on March 30. On May 6 that year, Arnold Hague has included her in the westbound Convoy ON 92*; she's not mentioned at all on my own page for Convoy ON 92, however, going back to Page 2, we see that she did leave Liverpool that day, but only went as far as Belfast Lough. It's possible, of course, that she had sailed in ON 92 for a while. She's also listed as bound for New York with general cargo in ON 94* about a week later (originated in Liverpool on May 12, arrived Halifax May 25). Evanger, which served as Commodore Vessel again, had sailed from Belfast Lough on May 13, joining ON 94 from there, arriving New York on May 27. She had again been in the company of other Norwegian ships, namely Carmelfjell (returned), Dux, Ingertre, Jan, Mathilda, Norelg (also returned) and Torfinn Jarl. Her next Trans-Atlantic voyage commenced on July 3 that year, when she's listed in Convoy SC 90 from Sydney, C.B., general cargo for Liverpool, heading back to New York with Convoy ON 118*, which departed Liverpool on Aug. 1 and dispersed Aug. 20, Evanger arriving New York independently the next day. She had again served as Commodore Vessel. Dux, Nea, Norvarg, Rio Verde, Spero and Tore Jarl are also listed. On Sept. 5, we find her in Convoy SC 99 from Halifax to Liverpool, subsequently joining the westbound Convoy ON 138*, which departed Liverpool on Oct. 11, arrived New York on Nov. 3, and included the Norwegian Ferncliff, Harpefjell, Henrik Ibsen, Lista, Maloja (detached, sunk - follow link for more info), Norheim and Petter II. Evanger had served as Commodore Vessel again. Her subsequent voyages are shown on Page 2 an Page 3, while convoy information for some of them can be found in the Voyage Record above. Skipping now to July 30-1943, when I have her in Convoy SC 138 from Halifax, arriving Liverpool on Aug. 12, and at the end of that month she's listed as bound for New York with general cargo in station 31 of the westbound Convoy ONS 17*, which also included Fernbank, Grey County and Suderøy, while Potentilla and Rose are named among the escorts (see ONS convoy escorts). Evanger served as Commodore Vessel again and arrived New York on Sept. 19. With a general cargo for London, she headed back across the Atlantic on Oct. 11 in Convoy SC 144 from Halifax, later joining the westbound Convoy ONS 24* in order to return to New York. This convoy originated in Liverpool on Nov. 30 and arrived Halifax on Dec. 18; Evanger arrived New York on Dec. 21, having joined from Oban (see Page 4). Atlantic, Brush, Chr. Th. Boe, Grey County, Solstad and South America are also listed. At the end of Jan.-1944, she served as Vice Commodore Ship for the slow Convoy SC 152 from Halifax, general cargo for Liverpool, with arrival Febr. 15, heading back across the ocean later that month with Convoy ONS 30*, together with Henrik Ibsen, Para, Sommerstad and Veni. The convoy left Liverpool on Febr. 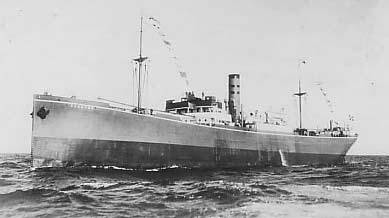 27 and arrived Halifax March 13; Evanger arrived New York March 16, then returned a month later in Convoy SC 157 from Halifax, general cargo for Tyne, where she arrived May 5. At the beginning of June she's listed, with Henrik Ibsen, Idefjord, John Bakke, Mui Hock, O. B. Sørensen, Thalatta, Torborg, Vav and Vinga, in the westbound Convoy ON 239* (departure Liverpool June 3, arrival New York June 22), returning to the U.K. in July in the large Convoy HX 300 from New York, again bound for Tyne with general cargo, arriving there on Aug. 8 (Page 4). We now find her in the westbound Convoy ON 251*, which originated in Liverpool on Sept. 1, arrived New York on the 19th, and included Bernhard, Elg, Ferncliff (returned), Fjordheim (sunk - follow link for details), Germa, Grey County, Heimgar, Henrik Ibsen, Rutenfjell, Snar, Thorhild, Tungsha (Commodore Vessel), Veni and Vera, as well as the Panamaian Norbris, which had Norwegian managers and can be found under the N's on this website. On Oct. 4, Evanger joined Convoy SC 158 from Halifax, general cargo for Avonmouth, where she arrived on Oct. 20. In the middle of the following month, she's listed as bound for Halifax with coal in Convoy ONS 36*, which originated in Liverpool on Nov. 13 and arrived Halifax on Dec. 3. A. Hague has also included Geisha (Commodore vessel), Grey County, Heimgar, Henrik Ibsen, Marie Bakke, Minerva, Snar, Sommerstad, Tropic Star, Velox, Veni and Vinga. Christmas that year was celebrated while in Convoy SC 163 from Halifax, general cargo for Manchester, where she arrived Jan. 5-1945 - again, see Page 4). With Atlantic, Gausdal, Geisha, Maud, Sommerstad, Titanian, Veni and Vinland, Evanger subsequently joined the westbound Convoy ONS 41* (departure Liverpool on Jan. 29-1945). She arrived St. John's, N.F. on Febr. 18, proceeding to Halifax a few days later, remaining there for over a month (see Page 5). According to A. Hague, she now went back to the U.K. in Convoy SC 171, which left Halifax on March 27 and arrived Liverpool on Apr. 10. This convoy is not yet available among the SC convoys included on my website, but will be added - see ships in all SC convoys. Arosa (returned), Grey County, Henrik Ibsen, Ima, Morgenen, Norsktank, Norvarg and Vinga are also listed. The last Trans-Atlantic convoy voyage Evanger made was with Convoy ONS 49*, which started out in Liverpool on May 2 and also included Askepot, Brush, Germa, Grey County, Henrik Ibsen, Iron Baron, Maud, Orwell and Velox. Evanger arrived Montreal on May 19, having sailed from Belfast Lough on the 3rd. In other words, she was at sea when the news of peace in Europe was received. Page 5 shows the rest of her voyages, up to and including most of Apr.-1946. As will be seen, she got to go home to Norway in Oct.-1945. * All the ON and ONS convoys mentioned here are available and will be added to individual pages in my Convoys section in due course, along with further details on each. In the meantime, the ships sailing in them (and escorts) are named in the section listing ships in all ON convoys and ships in all ONS convoys. See also ships in all SC convoys. Sold in May-1952 to Manners Nav. Co. Ltd., Hong Kong and renamed San Jorge. Sold in 1955 to China Shippers Co. Ltd., Hong Kong, renamed Tokyo Breeze. Sold in 1957 to World Wide S.S. Co. Ltd., Hong Kong, renamed Golden Kappa. Broken up in Hong Kong in 1958. Back to Evanger on the "Ships starting with E" page. Other ships by this name: This company had previously had another Evanger, delivered in 1908 as Loiret (of La Rochelle), purchased by Westfal-Larsen in 1912. This ship later became Tosca, then Braa, then Varangnes - follow link for further details. Westfal Larsen had another Evanger after the war, built in Bergen 1955, 7143 (7942?) gt. Renamed Ameta 1972 (Sverre Amundsen, Haugesund), under T/C as Concordia Ameta 1972-1978 (Christian Haaland, Haugesund). Sold to Germany in Febr.-1979 for breaking up. See also this external page and scroll down to Evanger.